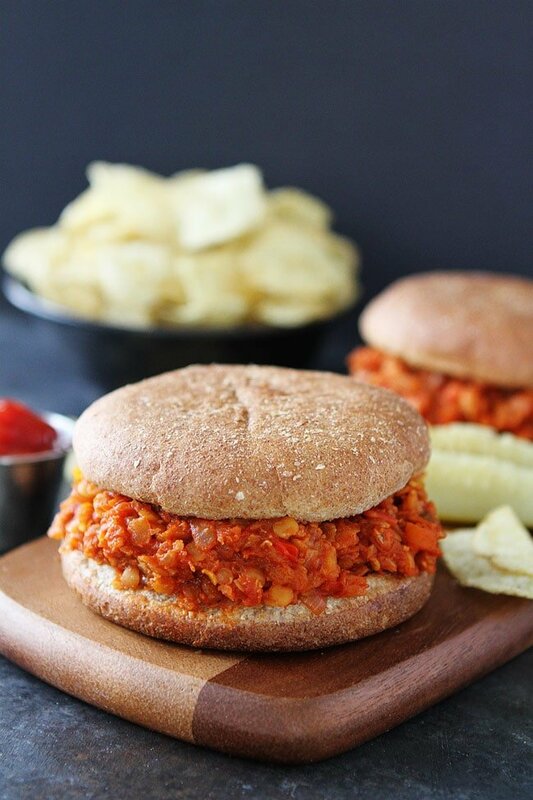 Cauliflower Lentil Sloppy Joes-Easy vegan and gluten free sloppy joes that are kid friendly. Serve on a bun or in lettuce wraps for a delicious meal! In January, I shared a recipe for Cauliflower Bolognese and you guys ATE it up. Literally. So many of you have emailed me about how amazing the recipe is. I have also enjoyed seeing your pictures on Instagram. I am so happy you and your families are loving the Cauliflower Bolognese as much as I do. I decided to try the cauliflower lentil combo again because it worked out so well in the bolognese sauce. 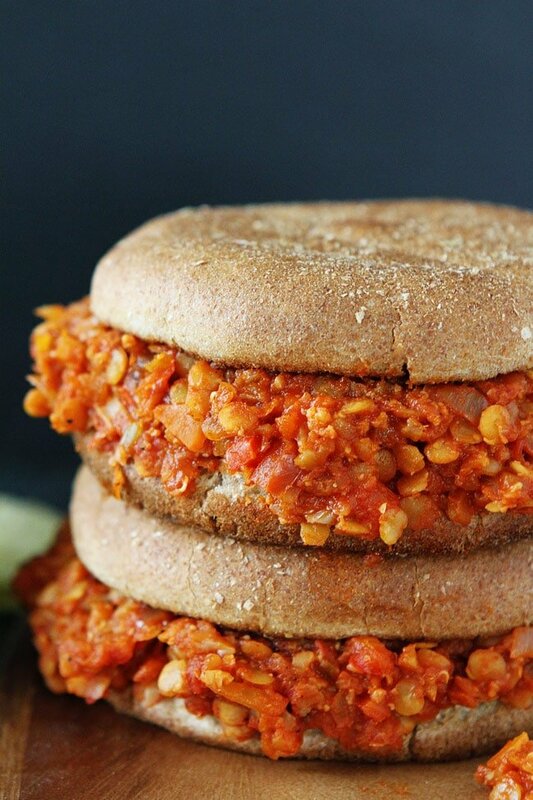 This time, I made Cauliflower Lentil Sloppy Joes and it’s another winner! You guys are going to love this one too. 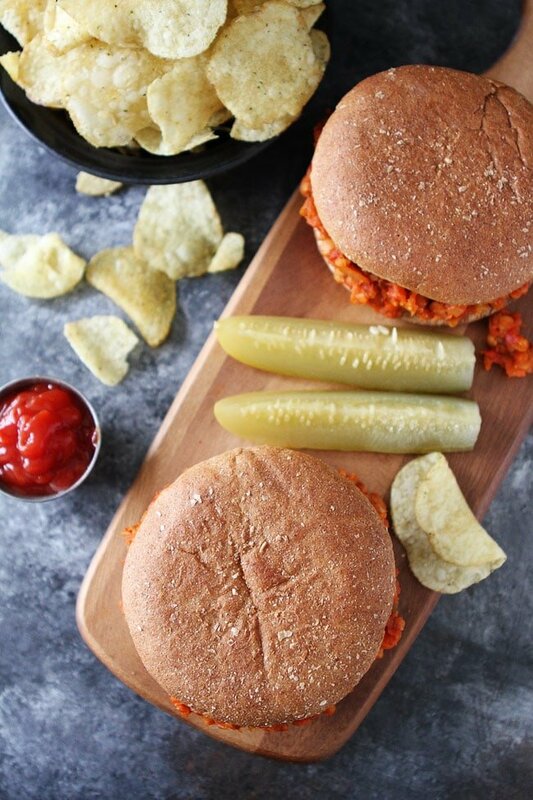 Traditional sloppy joes are made with ground beef, onions, tomato sauce, ketchup, Worcestershire sauce, seasonings and served on a hamburger bun. It is a loose meat sandwich and usually pretty messy. I am guessing that is why they are called sloppy joes, but I really don’t know. Makes sense to me! For my vegan version, I used cauliflower and lentils to get the same “meaty” texture. The flavor and texture was on point! 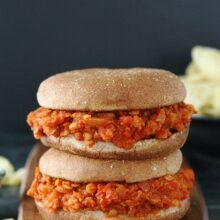 I served the sloppy joes on whole wheat hamburger buns and they were a huge dinner hit at our house. Our boys gobbled them up! If you don’t want to go the bun route, you could serve the sloppy joe filling on lettuce wraps, over spaghetti squash, or quinoa. The sloppy joe filling freezes well so you can always put some away for later. I have some in the freezer and I am going to pull it out for dinner tonight. It is perfect for Meatless Monday! I think I will make our favorite Baked Garlic Parmesan Potato Wedges to go with. Is it dinner time yet? 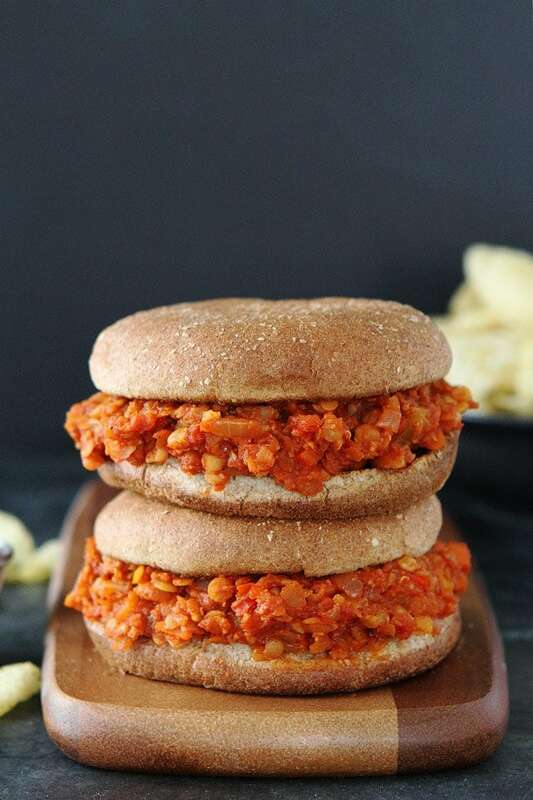 Don’t be afraid to try these Cauliflower Lentil Sloppy Joes, I promise they are a winner! All of my boys liked them, including Josh:) And make sure you try my Cauliflower Bolognese too! 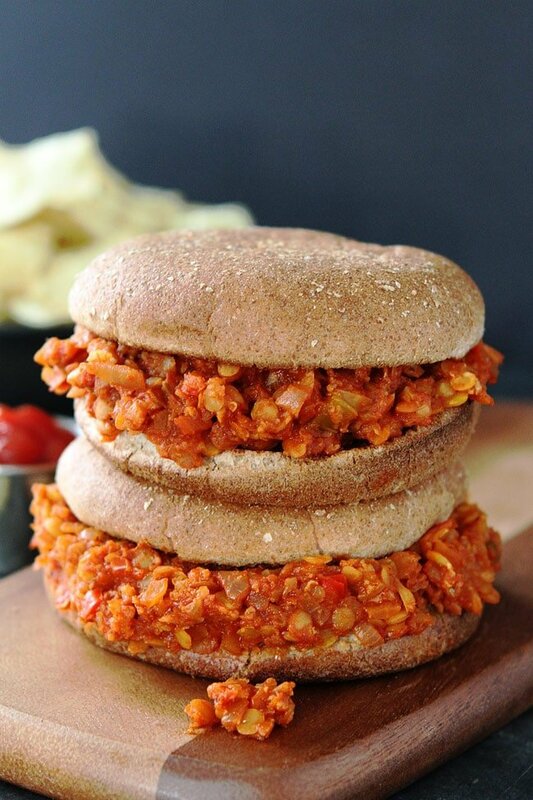 Kids and adults love these easy vegan and gluten free cauliflower lentil sloppy joes! They are great for lunch or dinner. In a medium saucepan or pot, bring lentils and water to a boil. Reduce to a simmer, and let lentils cook for 18-20 minutes, just until lentils are tender. Drain water and set the lentils aside. While the lentils are cooking, slice the cauliflower in half, removing the thick center core. Cut into large chunks. Using a food processor, break up the cauliflower into small pieces. Pulse the cauliflower until it looks crumbly. Put cauliflower in a bowl. If you don’t have a food processor, you can finely chop the cauliflower into pieces. In a large heavy-bottomed pot, heat the olive oil over medium heat. Add the onion, red pepper, celery, carrot and cook until soft, about 5 minutes. Add the garlic and cauliflower to the pot. Cook for 2-3 minutes. Stir in the crushed tomatoes, tomato sauce, ketchup, worcestershire sauce, red wine vinegar, sugar, chili powder, ground mustard, smoked paprika, and cumin. Stir in the cooked lentils. Season with salt and black pepper, to taste. Cook on low for 10 minutes. Taste and adjust seasonings to your liking. Serve the sloppy joe mixture on buns. You can also serve the sloppy joe mixture over spaghetti squash, quinoa, or make lettuce wraps. Note-for vegan and gluten free-make sure you choose a worcestershire sauce that is vegan and gluten-free! The sloppy joe mixture will keep in the refrigerator for up to 3 days. You can also freeze it for up to 1 month. You might have to add a little liquid to the mixture when you reheat it.